Peter Smart is the Chair of the Aberdeen International Airport Consultative Committee and an avid traveller. He also previously served as a member of the Air Users' Council. The views expressed in this article are entirely his own. Flybe's new 'Shuttle'. Aberdeen – Leeds Bradford – Southampton – Jersey. It really works. 27 October was an important date for route development by Flybe. Not only did it introduce six new routes from UK and Ireland provincial airports to London City on that day (see review, BTN). 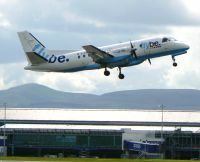 It also introduced its new ‘Flybe Shuttle’ linking Aberdeen in the north east of Scotland through Leeds Bradford and Southampton to Jersey in the Channel Islands three times each way on week-days, with fewer flights at week-ends. End to end, this must now form the longest direct regularly scheduled flight between two end points within the Common Travel Area (the UK, Ireland, the Channel Islands and the Isle of Man), at well over 500 miles. The airline went purple too. The concept is simple. You book a through fare between any of the four airports, and don’t leave the plane until you arrive at your final destination (not quite true northbound, where passengers originating in Jersey have to clear customs in Southampton, irrespective of their final destination). Being resident within the catchment area of Aberdeen International Airport, I decided to give it a try. Aberdeen to Jersey. Three ups and three downs. A scheduled 4hrs 20mins in the same seat on a Dash 8 Q400. Would I recommend it to family and friends, as all those customer surveys habitually ask? The following account relates to BE7001, departing Aberdeen 07:00 on 25 November. There are further departures at 11:50 and 16:50. The flight pushed back on time in Aberdeen and arrived a few minutes early into Jersey, with stops of 20 minutes in Leeds Bradford and closer to 50 minutes in Southampton. On the first leg there were just 12 passengers departing Aberdeen, of whom 8 disembarked in Leeds Bradford, three were bound for Southampton, and I was the only passenger going the full distance. By contrast, the 64 passengers loaded in Leeds more or less filled the Q400. Many of the passengers left in Southampton, to be replaced by a substantial number boarding for the final leg. The flight crew kept us updated (24,000 feet cruise from Aberdeen to Leeds and between Leeds and Southampton, and 16,000 across the Channel, so we were above the clouds and all three flight sectors were smooth). Kim and Mary in the cabin met all the attributes that might be expected of a cabin crew, punting refreshments from the trolley with a smile and with a cheery conversation, and generally making passengers feel at home. Of course, refreshments on Flybe are not complimentary, with coffee at £2.50, a ‘breakfast box’ at £4, and lunch and dinner time offers rising to £7 for ‘tapas and a Pimms’. On the other hand, through passengers are offered a small box ‘with love from Flybe’ at the stop-overs, with a small carton of water, a shortbread finger and a small pack of pretzels, to keep them going. Flybe’s pricing policy on the route enables passengers to choose from three levels of service: ‘Just Fly’ (flight, seat allocation at check-in and a carry-on bag), ‘Get More’, which also includes seat selection at time of purchase of ticket and a checked bag up to 20kgs, and ‘All In’ which includes fast track and lounge access where available, some included refreshments and free changes to flights. At the present time, the ‘Just Fly’ from Aberdeen to Jersey starts at £39.99 for dates in January onwards – just £1.50 more than a single ‘anytime’ standard class rail ticket from Aberdeen to Glasgow, about a fifth of the distance. Now that must be a bargain in anyone’s books! The Q400 is a generally quiet plane and certainly free of the vibration that some other turbo props suffer from. Its short take-off and snappy landing characteristics are well known. Flybe allocate generous legroom. So spending just over four hours on the plane was in no way uncomfortable – apart from the cold air that blew in through the front door at the intermediate stops. Thus, the 4hrs 20mins in the plane was no less comfortable than an equivalent time in a standard class seat on a train, and offered more leg room than many charter flights of a similar flight time. So ‘yes’, I would recommend this service to family and friends, except perhaps to any who get stressed out even at the thought of getting on a plane, because of the three take offs and landings en route. From the point of view of comfort, price, service and convenience of travelling from Aberdeen (or Leeds Bradford) to Jersey without changing planes, the service is a no-brainer. For us in Aberdeen, the alternatives would be an easyJet flight to Gatwick and an onward flight with easyJet or BA, with all the reclaiming and rechecking of baggage that the connection at Gatwick entails. 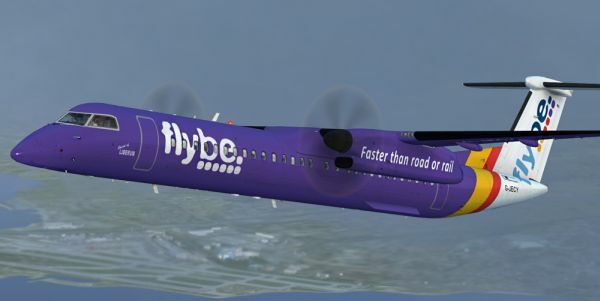 Aberdeen to London City on Flybe connecting to Blue Islands would be a great idea and both aircraft are on the ground at the same time, but a change is impractical. I just cannot see the Channel Island rivals getting together. One assumes that Flybe must be taking some element of risk with the Shuttle concept, until the service becomes better known. Between Aberdeen, Leeds Bradford and Southampton, Eastern Airways is the established carrier. Their base fares are more comparable to the ‘Get More’ fares of Flybe, but in return all passengers receive complimentary refreshments and a ‘free’ checked bag. Will head to head be good for competition, or will one airline or the other have to modify their service on the route in due course? Let’s hope that with appropriate marketing there will be room for both carriers and service frequencies, serving complementary markets. After all, Jersey is ideal for short breaks from the ‘Shuttle’ airports, and the north east of Scotland has much to offer those residents of Jersey (and once again the ‘Shuttle’ airports) who appreciate excellent golf, whisky and castles, amongst other attractions. No APD and Duty Free in the Channel Islands.